The unrest in Syria has changed everything, including the way people eat. But for Syrians, life has continued. People must eat, and individuals and farmers have adopted special means of keeping food on the table. Since revolt took hold of the country in 2011, Nuha (last name withheld by request), who lived in Columbus, Ohio, for 14 years before returning home to Syria in 2004, has been forced to store pickled vegetables, jams and pounds of frozen, cooked bread for the uncertain times ahead. Jars of Makdous ”“ eggplants filled with crushed walnuts and spicy pepper flakes ”“ line Nuha’s pantry. Over the past few years, the security situation has deteriorated, making travel to social gatherings outside Nuha’s immediate neighborhood rare. As a result, gatherings with neighbors, ostensibly to make food, have become important social outlets. Nuha and others regularly make dozens of balls of kebbeh ”“ a half ounce or so of minced beef set inside a thick bulgur shell shaped like a football, then deep-fried and eaten with yogurt. Nuha and her neighbors contribute ingredients, dividing up the kebbeh to be frozen for eating later. Gone are the days when meat-heavy barbecues would go on until late in the night in her neighborhood. “Meat is too expensive now. You don’t see people doing barbecues anymore,” she says. Across the country, people are being forced to adapt to a world where traditional paths to food are blocked. Families in the southern city of Deraa, where the revolt began in March 2011, plant vegetables in their gardens, as it’s often too dangerous to leave home to go to the local market. Syria’s farmers are also adjusting to their new reality. Along Syria’s coast, the country’s fruit and vegetable breadbasket, one farmer last year began collecting methane gas from an enclosed tank used to dump animal and food waste. There is a shortage of cooking gas now, and highways used to transport what gas is available are often impassible due to clashes. Using an irrigation pipe, he collects methane to fuel his stove and the stoves in his neighbors’ homes. “In addition to the advantage of manufacturing gas, I use the waste as an organic fertilizer for crops,” farmer Mohsen Josef told Syrian business magazine, al-Iqtisadi. But even as farmers come up with novel solutions to get by, the impact on Syrian farming has been crippling. “I was there in June and met farmers in Homs,” says Abeer Etefa of the World Food Program (WFP). “They can’t access their lands, they’ve left their property,” she says. “Their machinery is gone and they’ve no access to seeds.” The organization is planning to assist 4.25 million people this year. Shepherds once grazed sheep flocks along roadsides, but locals now fear being shot at by the soldiers and militias manning the hundreds of checkpoints scatter across Syria’s road network. Farmers delivering food in trucks to the capital, Damascus, and other urban areas, are regularly stopped from entering cities when a security threat is expected. The result? The food is lost and farmers don’t get paid. 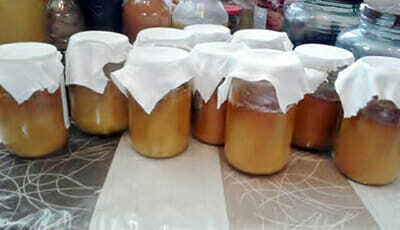 Nuha, a school teacher who lives just outside Damascus, prepares long-lasting foods like this apricot jam to shore up her food supply. 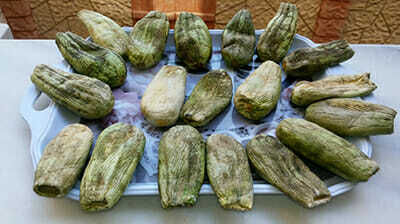 Dried, whole zucchinis prepared by Nuha. Rising food prices, up to 300% in the case of tomatoes and bananas, have affected farmers and consumers alike. Livestock production has been decimated. Poultry production has halved while beef and sheep production levels have fallen by a quarter and a third respectively. Olive oil produced in Syria’s northwest is being sold across the border in Turkey, forcing Syrians to pay inflated prices for whatever remains. In the besieged Palestinian camp of Yarmouk, five miles south of Damascus, an initiative called 15th Garden has seen local residents turn garbage lots and open ground into vegetable lots. “We got the idea to grow food in spaces between the buildings last September but we didn’t have the materials until April this year,” said Osama (last name withheld by request), a supervisor at a cell phone company who left Yarmouk last November. 15th Garden has about three-quarters of an acre of vegetables growing in several plots around the camp. Eggplant, zucchini, cucumbers and radishes the most popular vegetables. “There are three people planting and working the ground daily … the biggest problem we face is the security issue ”“ rockets fall all the time; water is also difficult to find sometimes,” says Osama. The FAO plans to spend $15 million on reconstructing small scale irrigation networks damaged by the fighting over the next five years. “[F]amilies face severely reduced purchasing power and rising food prices, including a twofold increase in the real price of wheat flour between 2011 and mid-2013,” reported an FAO study released earlier this year. 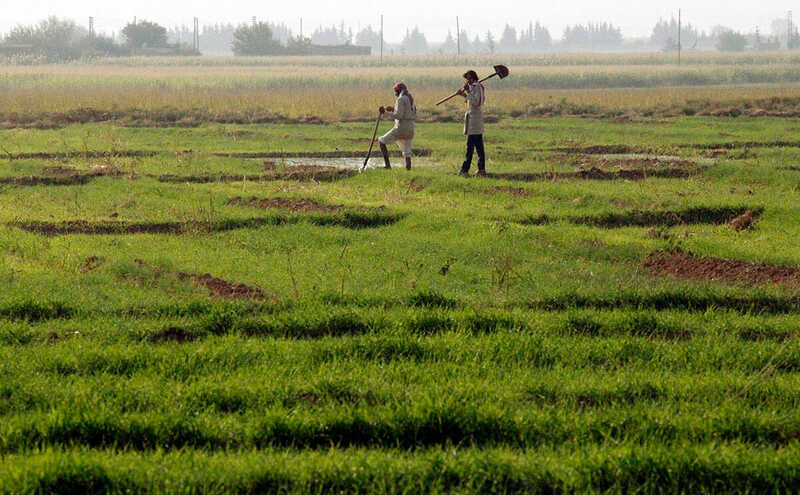 Radical jihadists now control much of northeast Syria, where the vast majority of the country’s cereals are produced. Etefa of the WFP says that before the war, Syria was practically self-sufficient. “But many of the wheat mills in the northeast of Syria have been destroyed or damaged” she says. Away from the war’s frontlines, it’s the rising cost of food that’s most difficult to deal with, says Nuha.